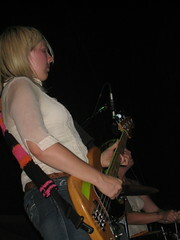 This photo of Ellie is about the only decent shot I got of Erase Errata, but I was admired her knitted bass strap cover. Erase Errata sounded good, but again, it was strange to see them in such a large venue. This was the first time I’d seen them in a few years and the first time without Sara Jaffe on guitar. Without the fourth person some of their crazy, frenetic energy seemed to be lost. They’re less rough around the edges, no trumpet, no weird hair or crazy outfits. They’re more than just a rock band, for sure, one of the best rock bands out there right now I would venture to say, but maybe… maybe we’re all just getting a little older (or I know I am and that crazy punk energy is really hard to sustain). I find their new album infinetly more listenable than the others, but live the songs didn’t seem to pack as much of a punch as the older songs.